This luxurious Stainless Steel Coffee Maker brews great-tasting coffee at cup-a-minute speed. 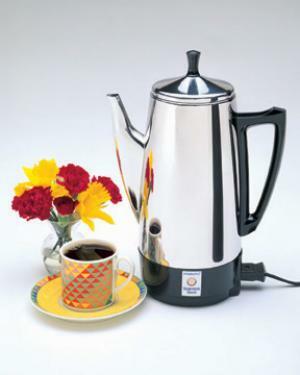 It makes 2 to 12 cups of rich, flavorful coffee, then keeps it piping hot automatically. Durable stainless steel construction, even the filter basket and perk tube, for easy cleaning and lasting beauty.